Early bloomer. Small pincushion flower heads in clusters, leafy stems, feathery bristles on top of the seeds. Also called Common Butterweed and Old Man in the Spring. Notes: Aster (Sunflower) family. Very common. The genus Senecio is one of the largest in the world with 2,000 species. Has been used as an herbal remedy for at least 2,000 years. It is mentioned by Pliny for toothache. It is mixed with wine for stomach ache. Groundsel tea is a purgative and is also used for intestinal problems, as an eye lotion and for chapped hands. It provides food for canaries. Caution: Large doses may be carcinogenic. 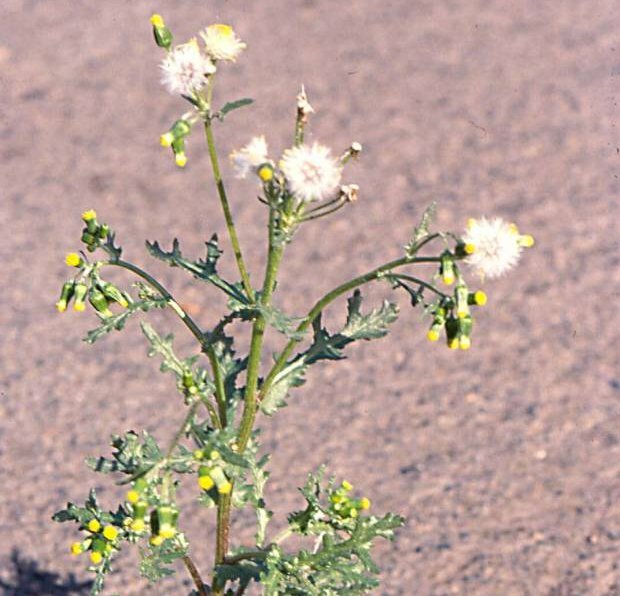 It probably gets its name from groundsel meaning ground swallower, a reference to its rampant growth. Senecio is Latin for old man referring to the tufts of white hair on the seeds.